As a consumer, you know how important it is for a retail store, pharmacy or supermarket to provide a copy of the return policy to each and every customer. However, as an owner of a retail establishment that sells products to the public, you will be required to do the same. Many people are under the impression that a return policy written on the back of a receipt is sufficient. This is a huge misconception, because return policies often run more in-depth and must outline every aspect of an exchange, refund and store credit. 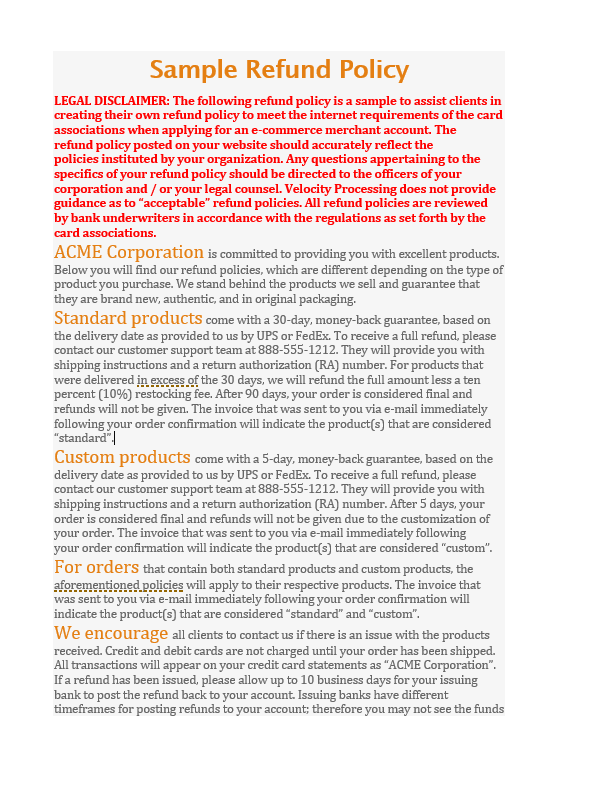 Devising a return policy will never be easier than with the refund policy template. This document is designed to put business owners a step ahead in creating a concise and understandable return policy. The template is customizable, but already contains the necessities to create a well-thought-out return policy. All you need to do is edit the content in the brackets, by personalizing it with your own information. Return policies are conditional agreements between the customer and business owner. It is crucial that the policy is written in a manner that every customer can understand the terms of the agreement. It should also be printed on the back of the receipt, where it will be easily access to every customer.